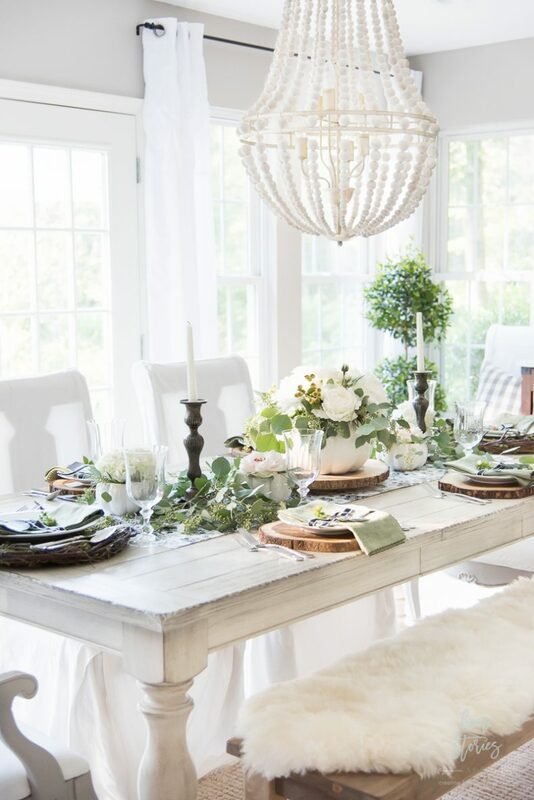 Gorgeous inspiration for a black, white, and green farmhouse table setting for fall! 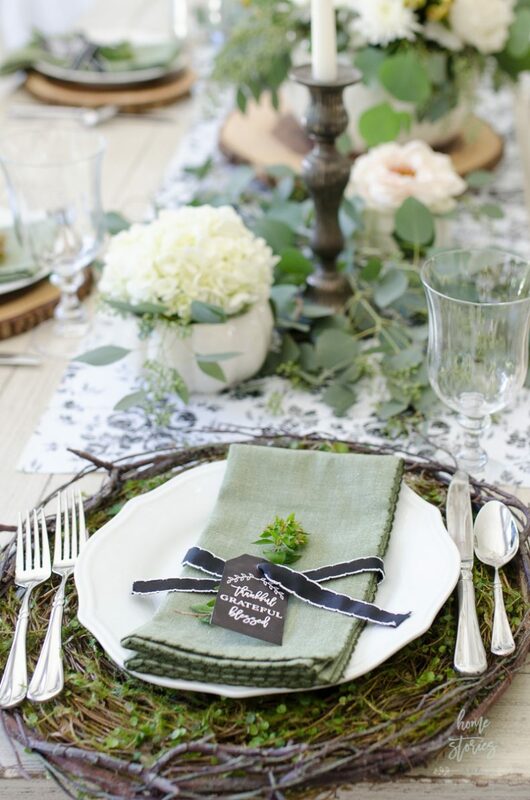 Glean some inspiration for an early fall wedding, or elegant fall dinner. 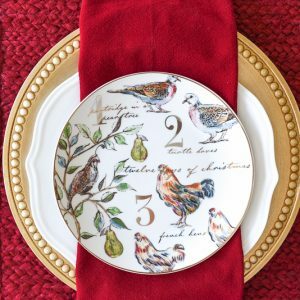 It’s no surprise that I love to create seasonal tablescapes, so I was thrilled when Layla from The Lettered Cottage asked if I’d like to join in her Fall Blog Hop! 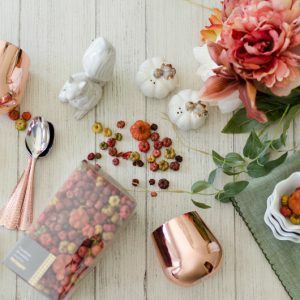 This week a few amazing bloggers will be sharing our favorite original fall ideas with you, so be sure to follow the hop links at the end of the post and pin, pin, pin the ideas you like. 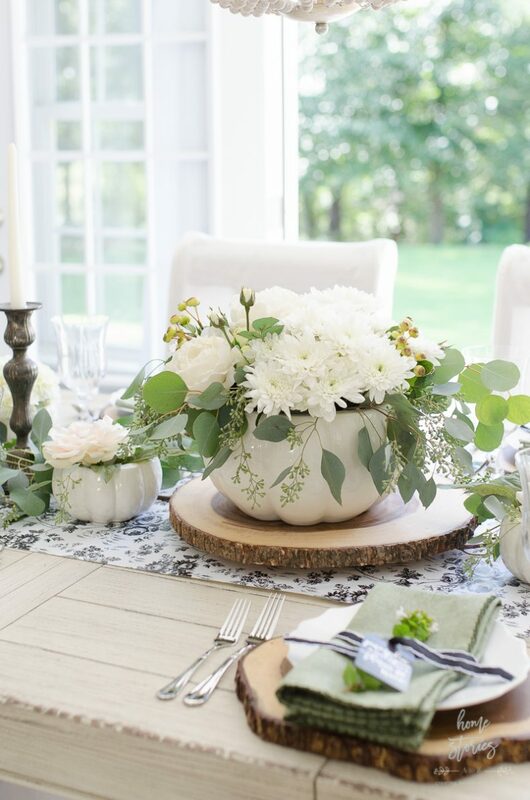 For my early fall tablescape, I created an elegant black and white farmhouse table setting that whispers fall to you like a sweet vanilla pumpkin spice dream! 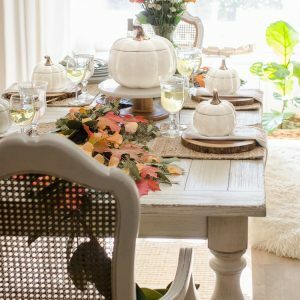 While I was editing pictures for this post I asked my husband if he thought people would want to see 51 gorgeous pictures of my fall table! He just said, “Uhhhhhh….hmmm. Well?” I took that as a no.  I had so much fun shooting my new dining room and admittedly went way overboard in the photo department; however, I did manage to pare the pics down in this post to only 18, so just know that I tried! 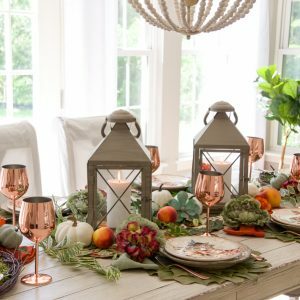 Back in August, I teamed up with Pier 1 to create a beautiful fall tablescape in traditional fall colors. 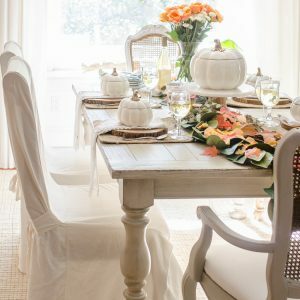 In that post, I teach you step-by-step how to set a table for fall–so go check it out if you haven’t already! 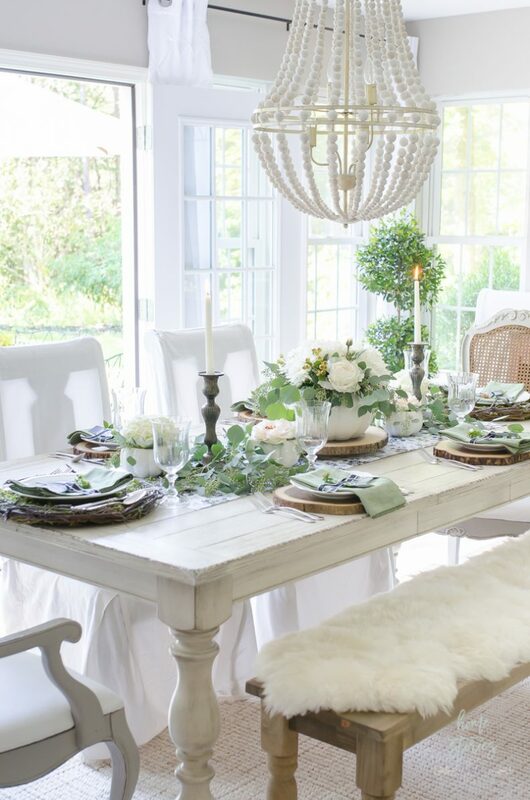 That tablescape provides gorgeous inspiration for creating a whimsical Thanksgiving look. But I didn’t want early fall to pass me by without creating a table that capitalizes on some non traditional fall colors. 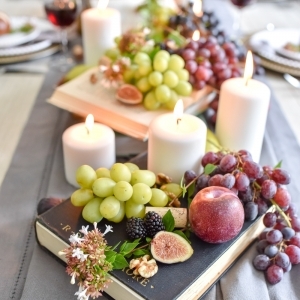 Non traditional seasonal decor always tends to be my favorite! 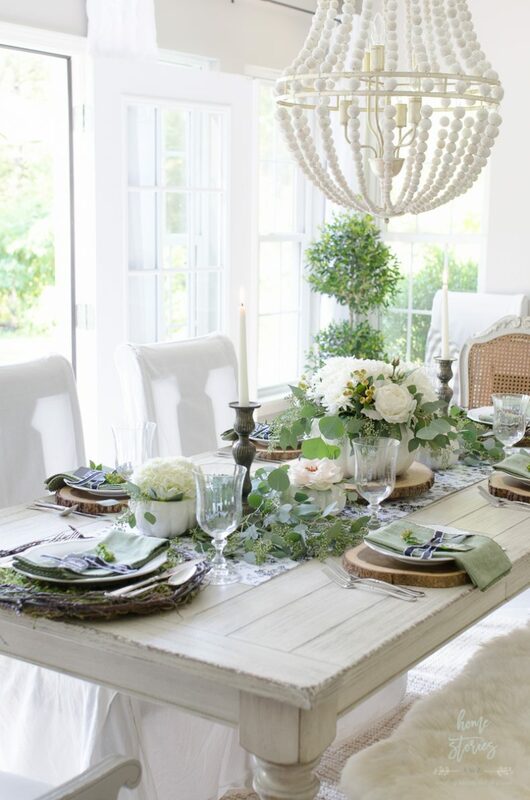 Keeping the cost of creating this table to under $50 out of pocket was imperative this year, so besides the hydrangeas,seeded eucalyptus, and table runner, everything else on the table is from items I already had on hand. I affiliate link to many items pictured in the post throughout and also at the end of the post, so if you see something that catches your eye be sure to look for the source links! 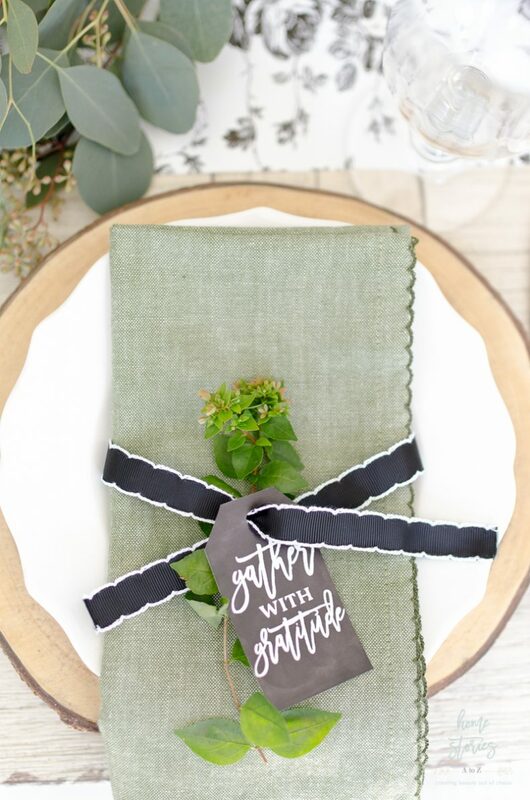 You won’t find a link to the beautiful table runner, but I’ll bet you’ll be able to find it at your local Dollar Tree of all places! I love the look of black and white floral toile wallpaper and have been considering using it somewhere in our new home. When I saw this shelf liner at the dollar store, it immediately caught my eye and I altered my original tablescape idea to incorporate it. I think it provides the perfect complement to the cute napkin chalkboard tags I made. More on those tomorrow! 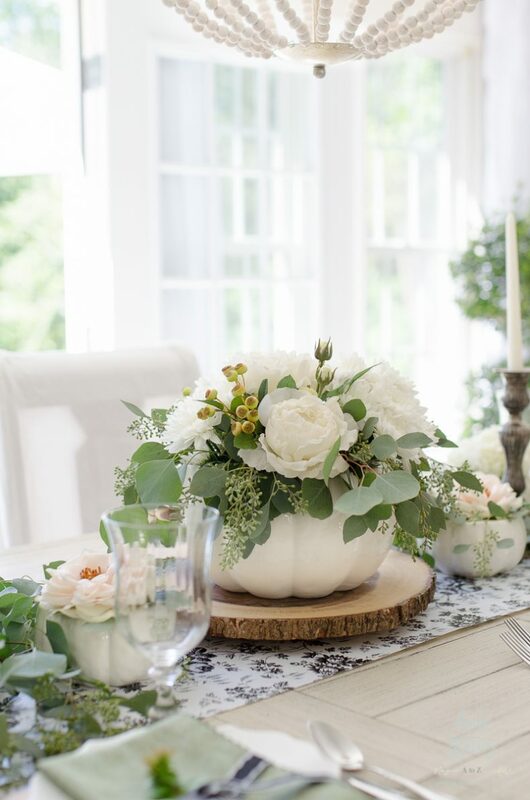 Down the runner I placed a pumpkin soup tureen and pumpkin soup bowls filled with a combination of faux and real flowers and foliage. 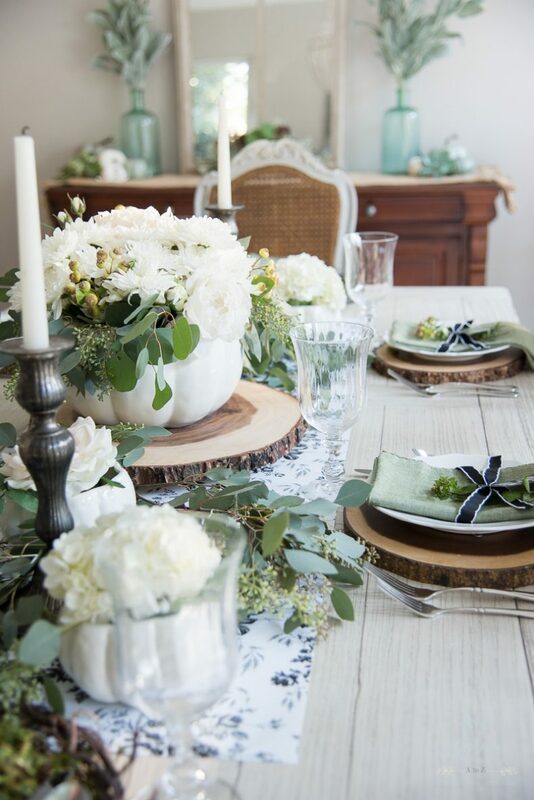 I always like to mix faux and real on my table. It’s difficult to tell that anything is faux when you fool the eye with enough of the real stuff. 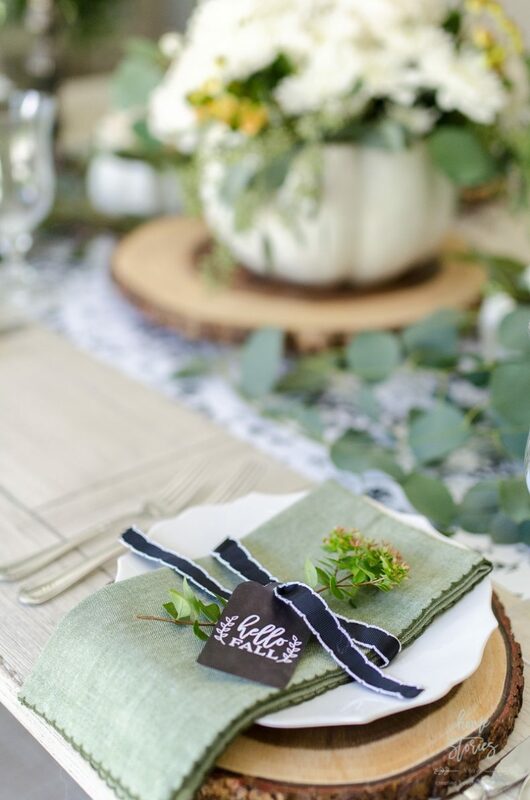 Some Abelia clippings, ribbon, and chalkboard tags serve as napkin rings. I’ll have the printable for the fall chalkboard tags available on the blog tomorrow. They turned out cuter than I’d even hoped! The ribbon is from Waverly at Walmart, and the green napkins are from Pier 1. I sometimes have a tendency to over-decorate everything and have to remind myself that sometimes less is more and more is cluttered. For this table, I was determined to keep it somewhat simple, yet still classically me. I’m no minimalist, but in this new home I find myself gravitating toward a slightly cleaner and more sophisticated look. It’s fun to allow a home to “talk to you” and inspire decorating choices along the way. 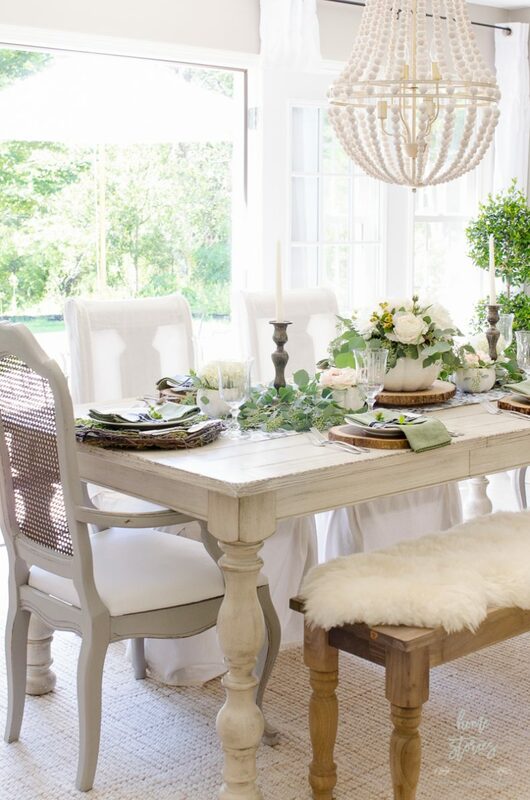 Our dining room is one of the rooms in the new house that didn’t require much of a makeover and is a joy to decorate! The french doors in the dining room open up to the back patio and are one of my favorite aspects of the room. As you might be able to tell from the photos, the light in this space is fantastic and makes my Vitamin D loving self so happy! I will often work on my computer in here during the day because it’s such a calm and soothing space. I am thankful, grateful, and indeed blessed to be enjoying fall in our new home! I hope you enjoyed the inspiration and gleaned some non traditional fall decorating ideas for your own space. Thanks for stopping by! You can visit everyone on the blog hop by following the links below. 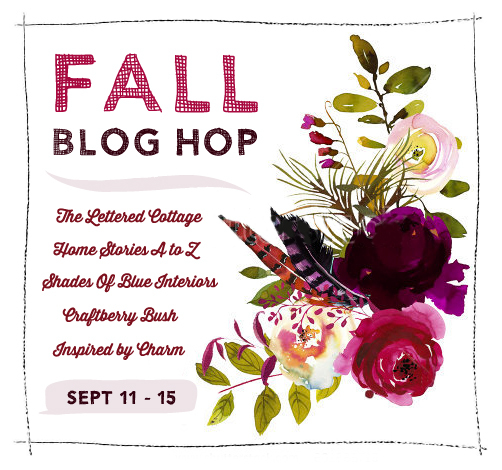 Monday–Layla from The Lettered Cottage is sharing a fall mantel. 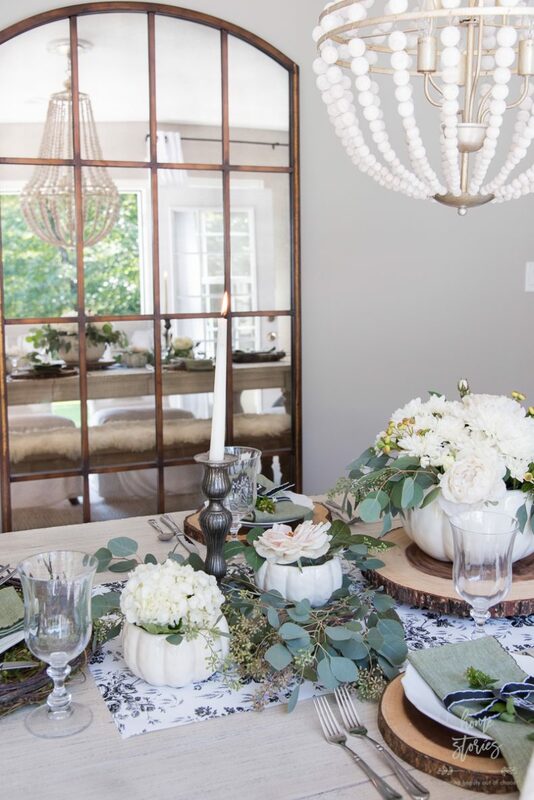 Tuesday–Beth from Home Stories A to Z is sharing a fall tablescape. Wednesday–Michael from Inspired by Charm is sharing a fall recipe. 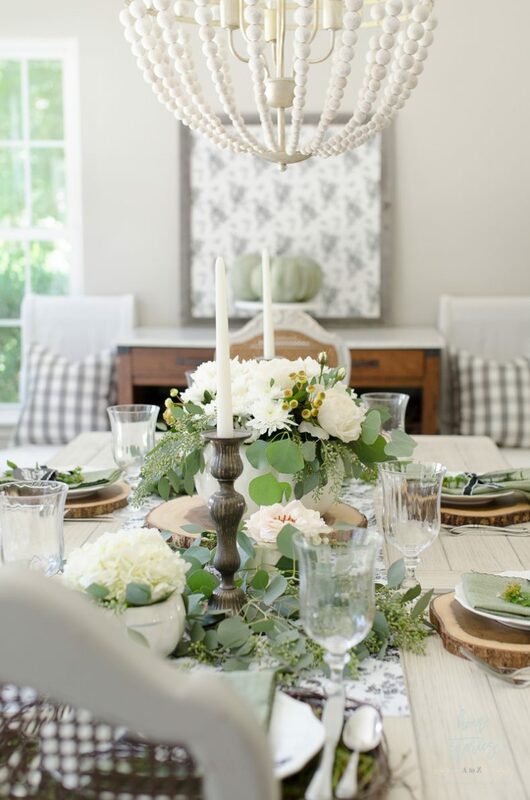 Friday–Rachel from Shades of Blue Interiors is sharing a fall decorating post. Click the blue/gray affiliate links to shop or for more information. Dining Room Table purchased on Hayneedle. Currently on sale! Dining Room Chair Slipcovers from Target. Dining Room Bench from Amazon and stained. Chandelier from Joss and Main. Also found here. Sideboard with Faux Marble Top found on Amazon. Sheepskin Rug on bench from Wayfair. Floor to Ceiling Arched Window Mirror from Amazon. Arched Window Mirror on buffet found here. Similar look here. Dining Room Paint Color custom blend by previous owner but very close to Benjamin Moore Revere Pewter. Wood Chargers from Better Homes & Gardens at Walmart also found at World Market. 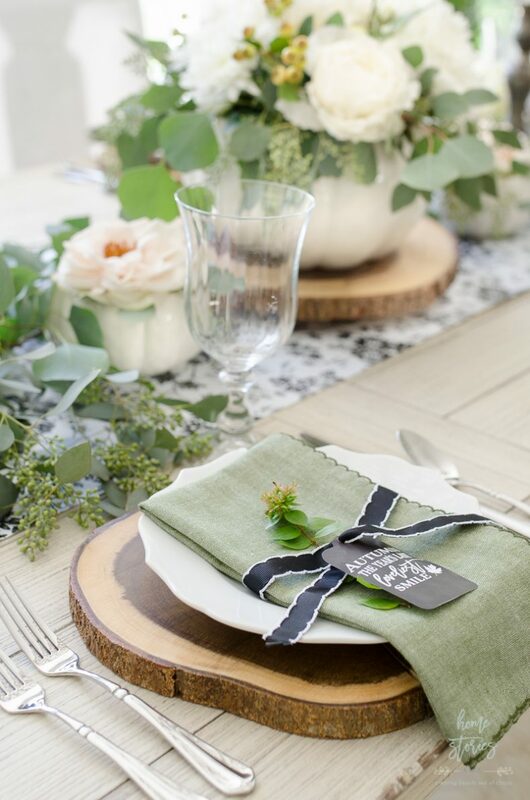 Chambray Green Napkins from Pier 1. Fern Twigs Placemat from Pier 1. 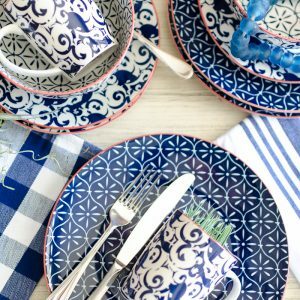 White Plates from Better Homes & Gardens at Walmart. Silverware is Mikasa French Countryside Pattern. Pumpkin Soup Bowls holding flowers from Better Homes & Gardens at Walmart. Whitewashed Tiered Tray Stand on bar cart from Pier 1. 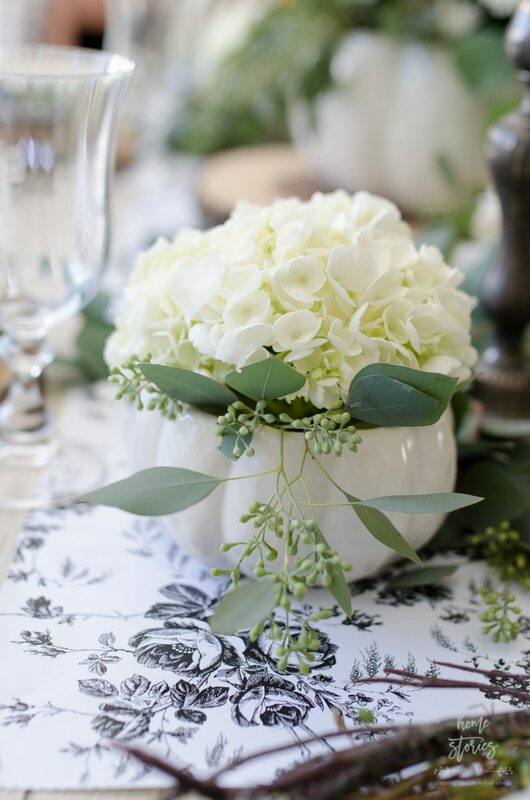 Black and White Floral Runner found at Dollar Tree. It’s shelf liner. Flowers from Joann’s and Trader Joe’s. Gray and white gingham pillow covers from Ikea. Similar options found here . Gray floral Pinboard from Minted. Green faux pumpkin from Michael’s. Wow, it’s absolutely gorgeous! And your backdrop of windows- stunning! This is stunning!!! This is just beautiful! Just beautiful Beth, as always. Sooo lovely Beth! I just love seeing how you’re decorating your new beautiful home! It’s all so gorgeous Beth! 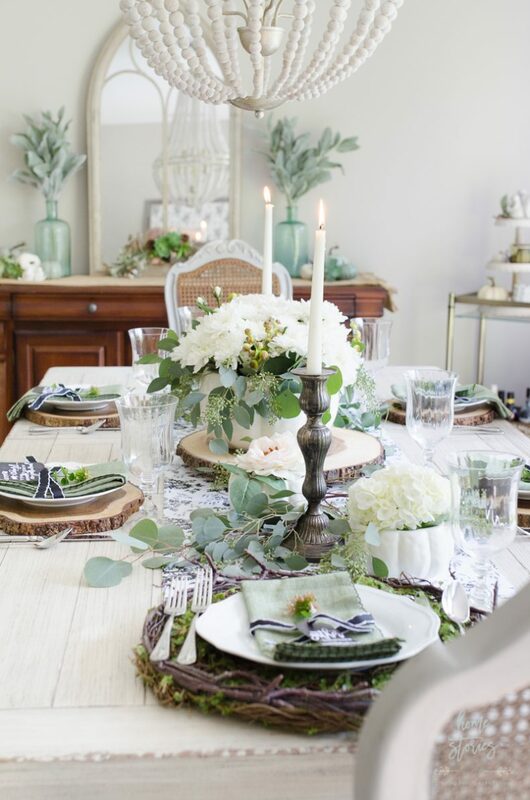 I love the soft color palette and all the fresh greenery. Bravo! Thank you! I’m really loving this soft, subtle look. It’s calming amongst the chaos! Oh goodness Beth! This is truly breathtaking! 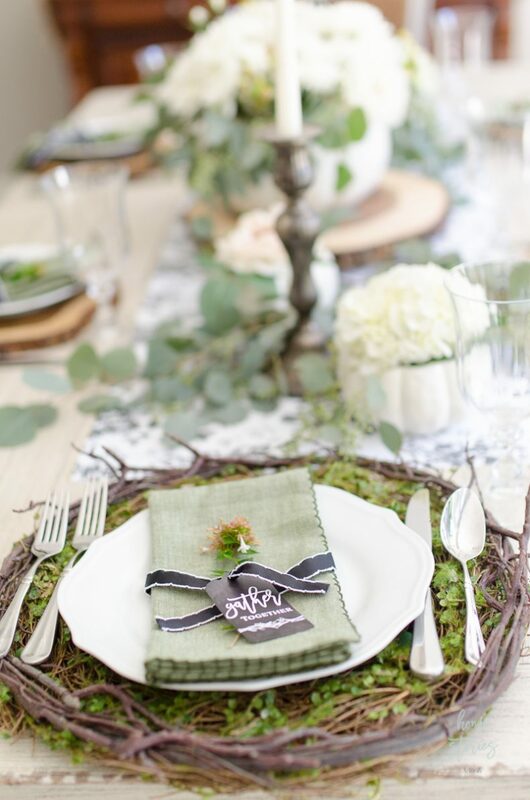 I love how you mixed so many beautiful natural elements into your table scape. Breathtaking and well done, my friend!